We have been gone a week, and I have been negligent about posting. I am amazed at how fast the days pass and how tired we are at night. Wifi coverage hasn’t been great even when we’ve been at a marina with free wifi. Charleston Harbor Marina’s is so slow and non-existent at times. Supposedly they have spent many thousands of dollars to upgrade but Lakeshore Marina’s” wifi on a stick” by our slip surpasses them all! Anyway we have decent coverage tonight. 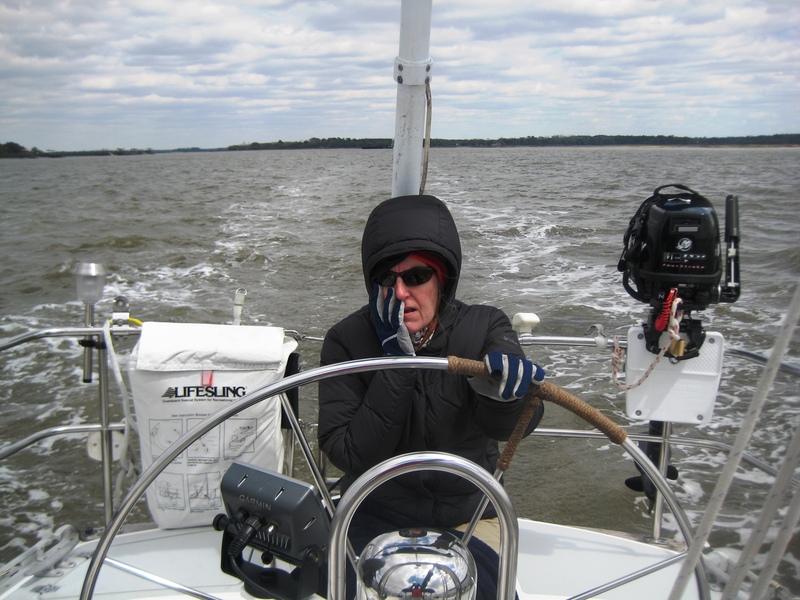 We finally left our slip on Tuesday morning, March 26th to bracing cold wind. To think I almost didn’t pack my down filled jacket! Thanks to assistance from the marina guys leaving port was uneventful. 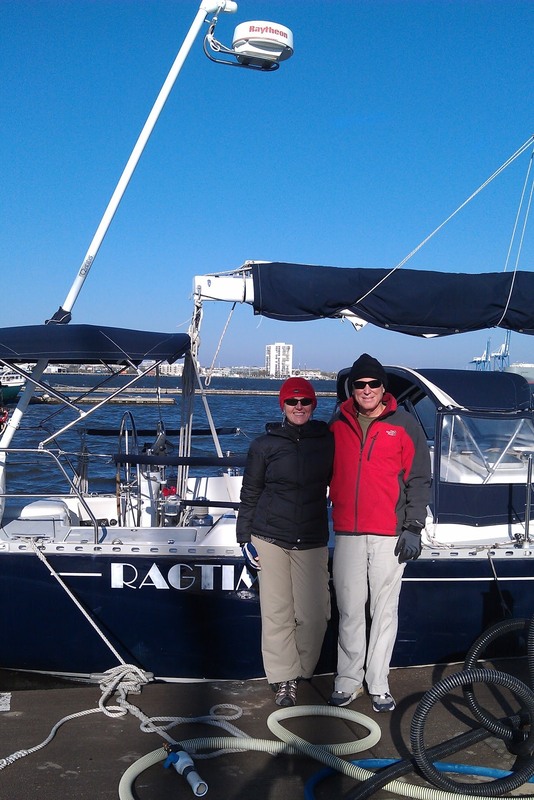 We motored across Charleston Harbor and headed for the ICW and our first bridge opening at Wapoo. We timed it fairly well and had little wait time. Of course this part of the ICW is familiar to us which was nice since being terribly cold hinders my alertness and thinking. James was kind and did the majority of the steering. I fixed food, hot drinks, navigated, and trekked up and down the steps while trying to keep as much warmth in the cabin as possible. 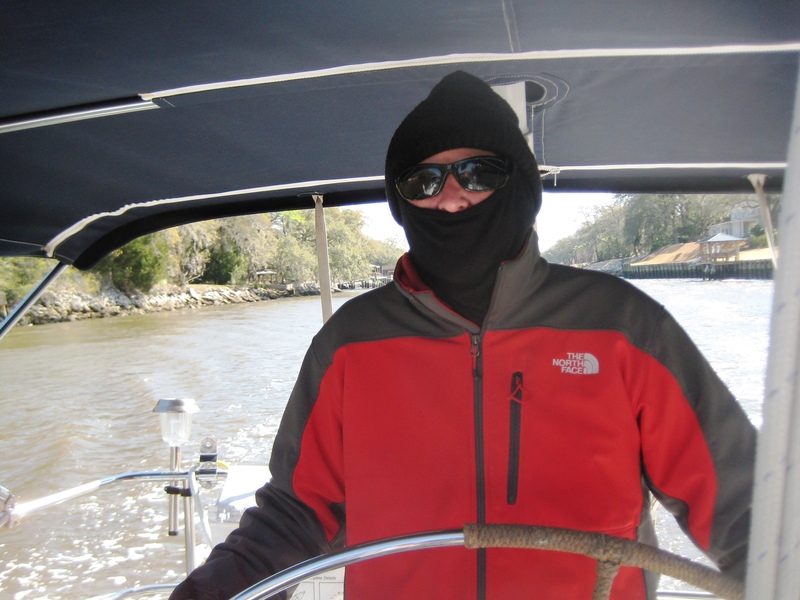 The cabin cooled quicker than I would have liked once we had anchored in South Edisto River. After eating supper and washing dishes, we quickly got ready for bed so we could snuggle under our down comforter. The next morning it was 48 degrees. It’s amazing how fast one can dress, put something in the oven and get ready to be underway when you are wanting the engine on to warm you up. I know in a few weeks, we will be reversing this process!!! Each day has gotten gradually warmer with today topping in the low 80’s…not quite ready for that yet. My face hurt and my eyes watered from the cold wind. I was thankful I had packed James’ face mask. Wednesday night we docked at Downtown Beaufort Marina in order to visit our friend, Anne Mitchell who lives in Beaufort. We had originally planned to anchor outside the marina and dinghy in, but it was so cold, we dreaded getting the dinghy in the water. We splurged for heat! I thought we would be splurging for A/C on this trip. As always, visits with Anne are delightful. Anne is an interior designer. She took us on a tour of a 20,000 square foot home on the water that she has been working on. We had a wine and appetizer tour of the home and a delicious home cooked meal at her house where we watched American Idol since a local Beaufort girl is on the show. It was strange to watch TV after seeing nothing for almost two weeks. 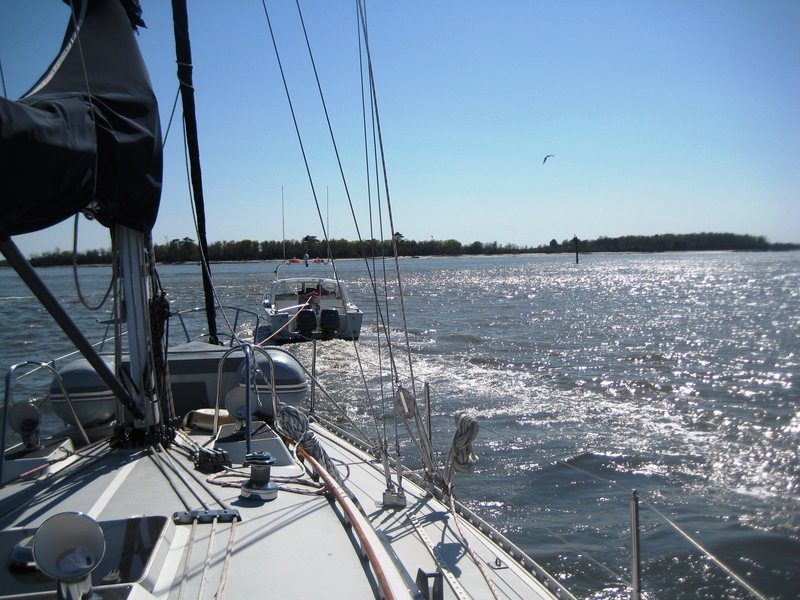 Continuing south we anchored in the Herb River, Wahoo River and South River. As it got a little warmer each day and we became more adept with anchoring and navigating, we fell into a comfortable routine until Thursday afternoon when we ran aground. Fortunately there was a man in a boat associated with BoatU.S. riding up and down this section of the ICW looking for poor suckers like us. Even more important, thank goodness we have insurance with BoatU.S. or it would have cost us at least $800! Yikes…that $75 a year sure is worth it. 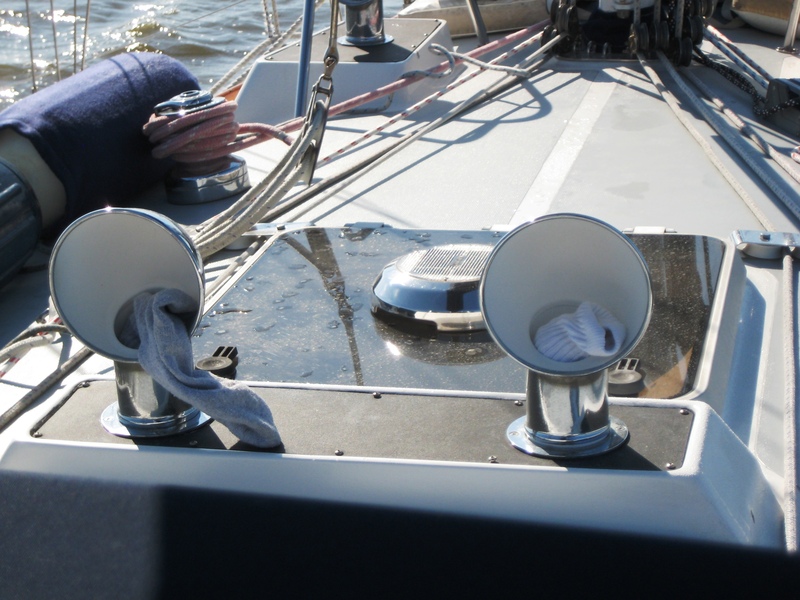 But as you may know in boating, nothing is ever simple and “comfortable”. Sunday morning (Easter) our engine would not turn over. It didn’t seem to be the battery although it did sound a little sluggish. After a couple of phone calls to our mechanic, Aaron and Bill “the wise one” Murdoch, we tried a few other things along with me praying! We were out in the middle of NOWHERE! James tried again to crank the engine, and it turned over!!!! Sunday evening we docked in Brunswick, GA at their marina. The Brunswick Landing Marina has really nice showers and laundry facilities (free) with a small Captain’s lounge with television. I was able to fold clothes and watch an old episode of NCIS. We also had our Sunday “bath”. I was beginning to feel a little grimy. Today was a short day because of timing our trip to pass through Jekyll Creek which is one of shallow areas on the ICW. We went through on a rising tide and didn’t set off the depth alarm one time. We are docked again at Jekyll Harbor Marina. 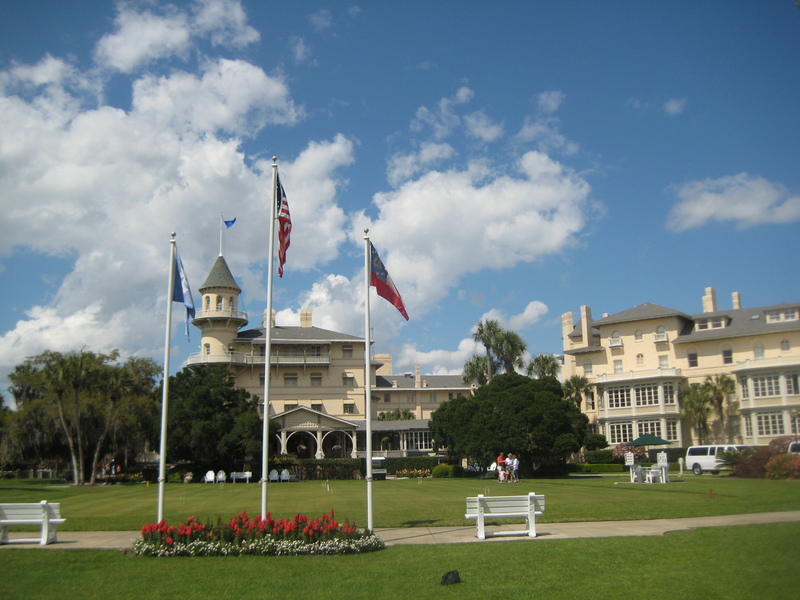 I was very excited about seeing Jekyll Island. I had always heard about Jekyll as a child but never went. A Georgia girl should at least go one time. Riding the bikes the marina provided, we toured the whole island. What a gorgeous day and beautiful place it is! Tomorrow we leave for Cumberland Island. I sure hope we see the horses.